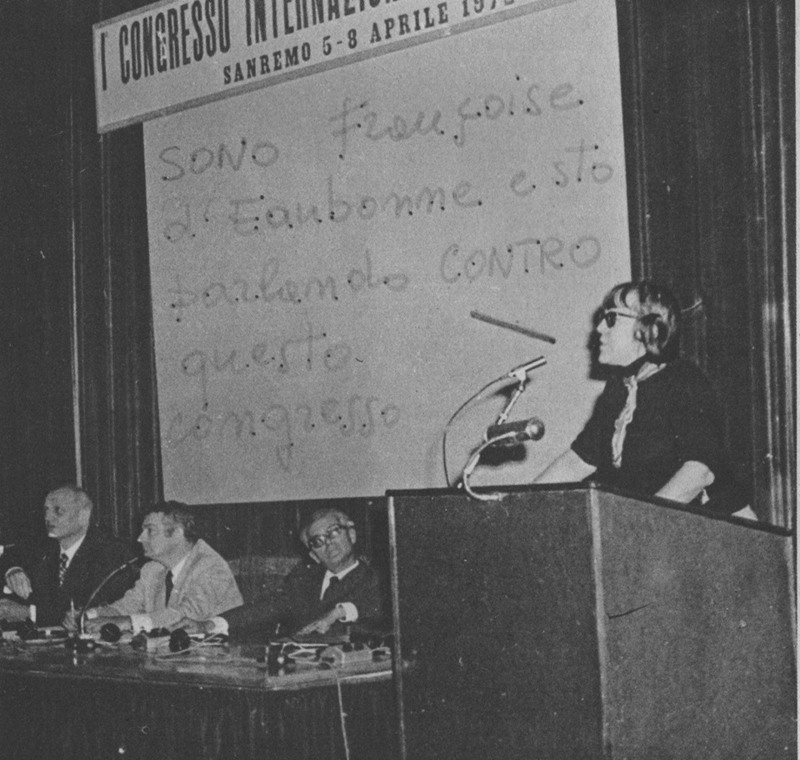 Francoise d’Eaubonne, FHAR leader, originator of the concept of “eco-feminism” and supporter of the urban guerrilla in West Europe disrupting the 1972 Sanremo Congress of Sexology. WHEREAS the one is getting ready to succumb to excess and asphyxia, and the other vegetates in starvation, they do not envision any road forward, other then the one, which has via industrial development made the capitalist camp gravely ill. WHEREAS China, which has gone the farthest in a sincere antagonist and anti-sexist effort, has only done so at the cost of a total contempt for the realities of sexuality, culminating in the castration of the individual and appropriated the same model of industrialization which repeats the universal error of society. WHEREAS the capitalist world has further exposed its monstrous hypocrisy, in announcing an anti-natalist campaign..to the THIRD WORLD while it contests, curtails, refuses or “legalizes” our right to contraception and abortion, in its terror to ensure that we are controlled in our subordinate, manipulated and controlled feminine condition. –the appropriation of fertility (the seizure of land from women). –the appropriation of fecundity (the discovery of paternity). A) our resolution to take in hand, with the control of our personal destiny, the demographic issue, in solidarity with our sisters in the Third World, and our will to hunt down and fight, on all levels, in the family, in employment, in the school, on the street etc, the universal system of patriarchy, which binds together ALL THE OTHER aspects of our oppression. B) our resolution in particular to fight by all means the insane construction of nuclear power plants, which are allegedly intended to replace certain energy sources, but in reality are for the arms industry and for profit. C) our DECISION (as the first warning) to announce and to organize a maternity strike of ONE YEAR by those of our signatories (the majority) who are capable of reproduction. Each of whom is to induce a great number of women from various countries to follow our example. And this is just the beginning. We will continue until a massive awakening of feminine consciousness, firstly concerning how the demographic crisis intersects with the disregard for our condition, and the destruction of the assets of LIFE of which we are the custodians.